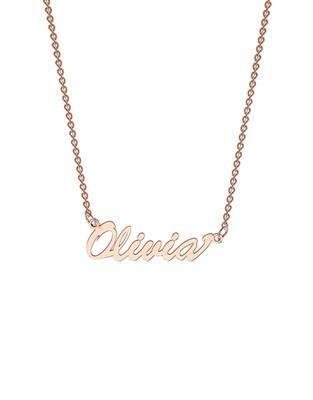 From the beautiful personalisable collection from me.mi is this fabulous name necklace, made popular by fashionista Carrie Bradshaw these name necklaces have become hugely popular and are a classic iconic accessory. Made from solid 9ct Rose Gold have a name made in to a beautiful piece of jewellery to create a wonderfully bespoke piece of jewellery. The perfect present to mark a special occasion, whether it's your wedding day, birthday, anniversary or arrival of a new family member, make their day fabulous with a thoughtful, unique piece of jewellery. Delivery is approximately 20 working days so we suggest you order in plenty of time for your special occasion. As these are made to order this necklace is non-refundable or exchangeable. Write your name or words as you would like them to appear at the checkout and double check your selection before completing your order.